You, in this case, are a Chiton. And yes, while you crawl around the ocean floor, you’ve got eyes looking all around you. They’re all your eyes and– here’s the weird part– they’re built into your body armor. They’re actually composed of armor. You’ve got armor-eyes. Now this little guy isn’t really a monster. 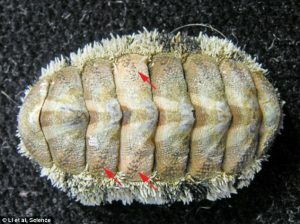 It’s basically a Pill Bug in the sea. Nothing scary about it. But we like to include ideas and items here that also appear in the book. And one of the moods we sought to create in certain monster situations was the feeling of being watched. The feeling that there might be eyes all around you. Which the Chiton is perfect for!